Local partners working together to protect and restore salmon habitat. Dumas Bay, Federal Way - June 8, 2019. Register online. Vashon-Maury Island Land Trust, Vashon - July 13, 2019. Register online. Discovery Park, Seattle - July 22, 2019. Register online. Chinook salmon, bull trout, and steelhead are listed as threatened under the Endangered Species Act. In this watershed, citizens, scientists, businesses, conservation groups, and governments are working together to respond to the decline of salmon and the lands and waters on which the fish depend. In 2005, the partners completed a science-based Salmon Habitat Plan. Carrying out the plan recommendations will protect and restore a healthy watershed ecosystem for both people and fish. Watershed salmon habitat recovery is part of the work of the Puget Sound Partnership. Funding for coordination of salmon habitat recovery is provided by 17 local governments in the watershed. 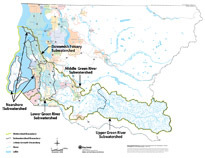 For an overview of the watershed and why we we are addressing salmon habitat on a watershed basis, view the watershed introduction page.